In the latest installment of the New York Times bestselling Paws & Claws Mystery series, Inn owner Holly Miller and her dedicated detectives—Trixie and Twinkletoes the cat—must sniff out a killer to keep Christmas from going to the dogs. 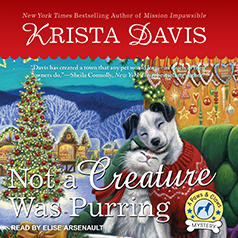 Inn owner Holly Miller finds it ruff staying cheerful over the holidays when the dead body of a beloved businessman turns up in the pet-friendly town of Wagtail, Virginia. Inspired by her German heritage, Holly's grandmother has arranged for Wagtail to have a Christkindl Market packed with goodies and decorations for the howliday tourists. But Holly's mood takes an unseasonable turn when she learns that her old flame and childhood friend Holmes Richardson has brought his fiancée home—and she'll be staying at the Sugar Maple Inn . . .
A love triangle becomes the last thing on Holly's mind when her Jack Russell Trixie's nose for trouble leads her to the corpse of a pet clothing tycoon. Now Holly and her dedicated detectives—Trixie and Twinkletoes the cat—must sniff out the killer to keep Christmas from going to the dogs . . .
"I really like Elise Arsenault and I think she does a great job with this series!" -Books, Movies, Reviews! Oh My!